Jack Morris will take his rightful place in the National Baseball Hall of Fame this summer. To celebrate this achievement and honor an amazing career we are pleased to release this very special Commemorative Art Bat featuring the reproduced work of noted artist Jolene Jessie. This full size bat showcases Morris' career stats and pays fitting tribute to his years as a member of the Minnesota Twins. Twins fans will love this special collectible bat, but we expect this rare item to create swift demand. Order yours before they are gone. This special collectible Art Bat is officially licensed. Due to the rare nature of this offer we must charge your credit card for the full price immediately upon taking your order. This policy ensures we reserve a bat for you. We will confirm your order by Email. This bat is not game used. Please allow 4 to 6 for delivery. 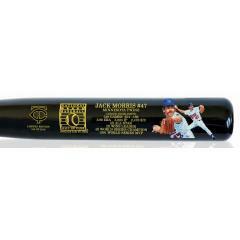 Jack Morris Twins Edition Hall of Fame Commemorative Art Bat $129.95 Sold Out!